FILE - An Afghan guerrilla handles a U.S.-made Stinger anti-aircraft missile in this photo made between November 1987 and January 1988. It may be just a matter of time before Russia’s continuing air assault on Syrian rebels persuades some of those backing rebel groups to even the fight by providing shoulder fired anti-aircraft missiles. The U.S. has consistently rejected proposals to provide the advanced weaponry, also known as MANPADs, to rebel groups, citing the damage they could do in the wrong hands and the fear that providing such weapons could draw Washington and its allies into an even more direct proxy war with Moscow. But officials fear that, at some point, U.S. allies may decide it is worth the risk. “If there’s a perceived threat, there’ll be some sort of counter action,” a U.S. official told VOA on condition of anonymity, adding there is no evidence yet that any rebel groups are being supplied with MANPADs. Syrian rebel groups have been desperate to get their hands on the advanced weaponry for years, first to counter the Syrian regime’s warplanes and more recently to fight back against the Russian bombing campaign. In 2013, some MANPADS did appear on the battlefield and Qatar was widely believed to have been the supplier, although this was denied by Doha. 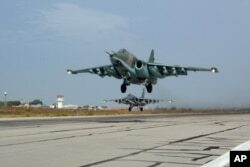 Russian Su-25 jets takes off for a mission from Hemeimeem airbase in Syria, October 22, 2015. There have even been persistent rumors about some Chinese made MANPADs reaching Syria via the black market, although military and intelligence officials have said there are no signs of any widespread use. Still, U.S. officials remain concerned. For the Syrian rebels, MANPADS would take away the one clear military advantage the Syrian government has over them — warplanes. "Rumors of the impending provision of MANPADS to Syrian opposition forces reflect a desire to blunt the Russian actions by both opposition elements and some of their supporters,” according to a U.S. intelligence official who was not authorized to discuss the matter publicly. There also are concerns about whether even vetted rebel groups could use them effectively. He said they met military officials last Thursday at the Turkey-based Military Operations Center staffed by Arab and Western intelligence personnel, including CIA officials, and, as well as requesting TOW anti-tank missiles, pressed the importance for the rebels of MANPADS, but it was made clear none would be forthcoming. 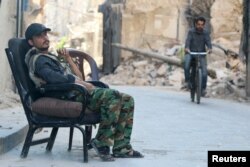 FILE - A Free Syrian Army fighter sits at a checkpoint as a man rides a bicycle past the rubble of a damaged building in the old city of Aleppo, Syria, July 13, 2015. Abdul Rahman, a commander with the Ahfad Omer battalion, part of the larger First Brigade, a U.S. backed secular militia, said they had made several attempts to buy MANPADS and recently had been negotiating with a mafia group in Turkey, but they realized they were being set up for fraud. “We understood that they didn’t have access to the weapons they claimed,” he explained. And they have cast far afield to net a supply of the missiles, including approaching Pakistani authorities. “They told us they would consider the request, but we have heard nothing,” he said. They are taking the non-response as meaning no. Some militias also have tried to recruit engineers from overseas to help them rig their own anti-aircraft missiles from old, non-functioning shoulder fired ones they seized in the past from Syrian government armories, but so far have failed to find any engineers willing to travel to war-torn Syria. Earlier this month, General Salim Idris,a top rebel commander, told VOA that shoulder fired anti-aircraft missiles would prove a major game changer on the battlefield, and that he had tried many times in the past four years to persuade the West and Gulf countries to supply them, but they feared the missiles would fall into jihadist hands. He has been pressing for them again since the Russian air campaign, but holds out no hope the coalition will rethink its position. One rebel commander noted that even if they do manage to secure some supplies on the black market, they will face the big challenge of getting them across the border. “How do we get them past the Turks?” he mused aloud.